When I was growing up, I wanted for nothing. I had food and clothes, a warm home and a loving family. I had everything I needed and it never occurred to me to want more than what my parents could provide. We moved around a lot when I was a kid. My father worked in agriculture and we moved from one rural community to another. Despite my love for big cities now, I was born and raised a small town girl. When I was 11 years old, we moved to the largest city we’d ever lived in. It’s now Canada’s sixth largest city, according to last year’s census. Things were definitely different in this city. Totally different from the small town I’d left behind. Here, the sixth-grade kids talked about money. They talked about designer clothes. They talked about the size of their house. Worse still, they made fun of those with less than them. To say that adjusting to this new life was difficult is an understatement. I wanted to fit in; what 11-year-old wouldn’t? But something always seemed not quite right. I missed my old friends and had trouble relating to and forming meaningful friendships with these new kids. I was just too different. Clothes and money seemed to be a big deal to them. They were wearing hundred dollar loafers and lots of Ralph Lauren. One day, everyone agreed to wear Polo shirts to school the next day. I was thrilled that I could join in, instead of sitting on the outskirts as I’d grown accustomed. The next day, I showed up at school wearing my hot pink ‘Polo’ shirt, only to have one of my classmates check the label for all to see and confirm that my shirt was not, in fact, a Ralph Lauren Polo shirt but rather a cheap knock-off from K-Mart. In the small town where I grew up, we just called that style of shirt a polo shirt, blissfully and innocently unaware that it referred to an upscale brand. But my edification at the hands of my new peers was swift. And then Tretorns came out. And almost every girl in my class had a pair. Some of them even had two pairs, boasting that they couldn’t decide what colour they wanted so their parents bought them both. While I secretly loved these shoes, I had a feeling my parents couldn’t afford them so I pretended not to care. But then they started a club. It was called the “We Hate Anthona” club (I kid you not), all because Anthona had a pair of knockoffs. Oh, geez. My days of not caring were over. I needed a pair of Tretorns and I needed them quickly! I broached the subject with my mom and got a kind but firm ‘no’. These shoes were $65 (and I’m talking 30 years ago) and as a growing kid, they wouldn’t have much longevity. “You’ll outgrow them in six months!” My mom said we just couldn’t afford them. I was crushed. I lived in fear of the day that these mean-spirited kids would start a “We Hate Natalie” club. Fortunately, my birthday was around the corner and I knew what I was going to ask for! How could my parents turn down my birthday wish? Even then, I knew I should have said no. I should have told him they were just shoes and that I didn’t need them. I didn’t need to fit in with those kids and I didn’t need to seek validation this way. I knew should have had more respect for his hard-earned money, which I knew didn’t always come easy. Because even though I didn’t have expensive shoes and designer clothes, my childhood was filled with other experiences, trips and books and theatre tickets. He gave me so many other, more important things. But I was 11 years old, so I said yes. My dad bought me those shoes that day and I was … happy, despite the nagging knot in my stomach. But all these years later, I’ve never forgotten that moment when my dad did as dads do … give everything they can to their children, even an overpriced pair of shoes they can’t afford. I learned a valuable lesson that day about life, about the things that matter and most importantly, about love and sacrifice. So … this is a long way of getting around to the topic of my new favourite travel shoes but I can’t talk about Tretorns without sharing the memory that’s so intricately tied to them! I’ve always loved this classic Scandinavian sneaker and some 30 years on, they’re still comfy and stylish, an easy choice for travel. I love to pair them with a skirt and T-shirt. I’d been thinking of getting a pair for a while but it wasn’t until I was walking through Lou & Grey the other day and there they were on display, that it felt like a sign and I had to get them. I saw them and was flooded with memories. 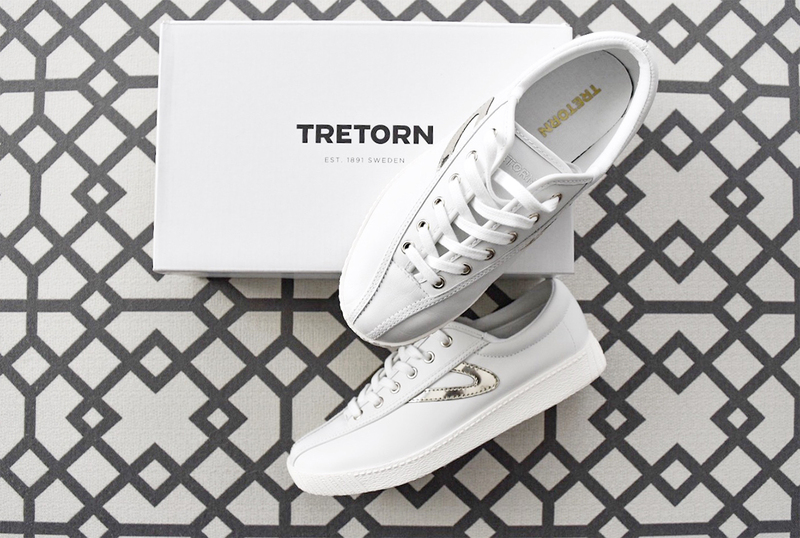 The original Tretorns are canvas and they still sell them (see here) but these new ones are leather with a metallic swoosh. The 11-year-old in me just couldn’t resist and every time I wear them, I think of you, Dad. Bullies be damned. Let’s start an “I love Natalie” club where everyone’s encouraged to wear whatever they please, regardless of branding and price tags. Happy to hear you’ve got your own pair now and can walk proudly in ’em with your dad’s love in your heart. Who can put a price on that? all in the same class growing up….I too, suffered at the hands of the “Richies”. It’s good to remember where we came from. 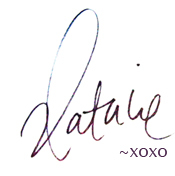 Love you Natalie! This entire story brought me right back to my childhood. As I read sentence after sentence, I was vividly picturing myself… Feeling that fear and having those thoughts. It’s crazy to think how all-consuming these superficial things were and how awful kids can be! This brought me to my senior year in high school where we all wore uniforms. A few times a year we could wear “normal” clothes. At the time the trend was Madras wrap-around skirts and I was made fun of because I did not have the latest thing. My dad took me shopping and let me pick out two skirts. This is a memory I forgot about until I read your post and remembered my dad who passed far too young. Thanks for your story today. Thank you so much for sharing your special memory. I’m sorry to hear about your dad’s passing; mine passed too young as well. We are lucky to have these memories and I’m glad you were able to relive this one. I knew this one was going to break my heart…. can’t see the screen for the tears. You are one special lady..